Isn't this puppy the cutest? I have a mild obsession with dogs, but I don't think I'm ready for the commitment of owning one. Do you have a dog? If so, what kind? Check out these awesome links from around the web. I might be late to the party but this blog that highlights aging style makes me oh-so-very-happy. Stars of yesterday mixed with the stars of today. I'm not a mother yet, but this article about french parenting is fascinating. This scale of the universe exercise might make you feel insignificant, but it will also blow your mind. Wow, I would love to wake up to the smell of these in the morning. My favorite Whitney Houston song. I've lurked my way over here from your sister's blog. I have a shelter pooch named Greta. She's been my very own for almost 6 years now. I love her more than an owner should love a dog. She is a terrier mix that was supposed to weigh between 15-20 pounds. The shelter was way off, since she's between 45-50.... I love her anyway. awww so cute! I love dogs. I have two. Adorable! I have a sweet (but crazy) 1 year old black lab named Bear. Dogs are so sweet, commit! aww I'm such a sucker for cute puppies. How did you know I have a soft spot for dogs, and especially puppies? So cute! That is a cute puppy. I'm not a dog owner because I have enough craziness in my life. Because you are a fashionista, you'll love my post today. hahaha! 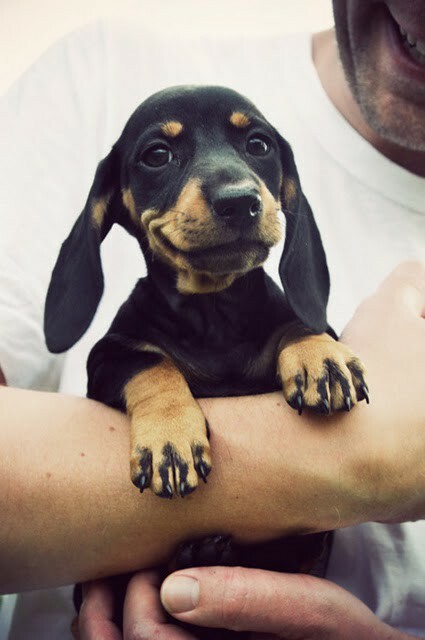 love that pic of that smiling puppy! As a cat person I thought I'd never have a gog, but lo and behold, after we saw the cutuest little jack russel terrier at the pet shop who looked at us with longing, sad eyes we couldn't resist and bought her. The first couple months of traning her are ... not so sure there's a word to adequately describe it haha. Be prepared for lots of mess, cleaning up and your shoes being chewed up. But now that she's older she is the most adorable little companion and is super loyal. So go for it, take the plunge and get a puppy! oh i am in love!!! super cute!! and that smile is the best!